With so many places to visit, planning a trip to Korea can be overwhelming. To help you decide where to go, Korea Tourism Organization has created a list of the top 10 most searched attractions in Korea during 2018. These attractions are perfect for adding to your tour schedule! If you only have a short amount of time, you can select a themed course of similar attractions. If your schedule allows, you can follow our three-day tour of all 10 attractions. No matter which option you choose, keep reading to find our travel tips for each attraction to make your visit much more enjoyable. Gyeongbokgung Palace was the main legal residence of the royal family during the Joseon Dynasty. 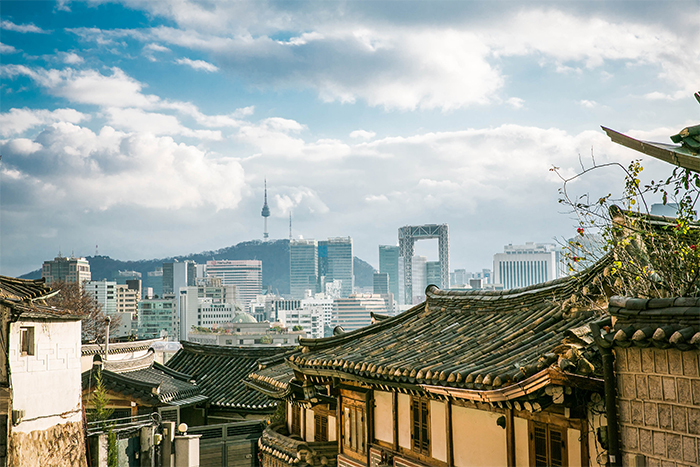 Carrying a meaning of “a place where the new king can enjoy prosperity of great blessings,” this was the first palace built during the Joseon Dynasty. The palace is unique for its vast area and harmony of buildings, and is the only palace to have all four major gates still remaining to this day. Within the palace grounds, you can see a multitude of restored buildings. Visitors will enjoy looking at the variations among buildings, each serving a unique purpose. Of course, even before entering the palace, tourists enjoy gathering at Gwanghwamun Gate to watch the Royal Guard Changing Ceremony; be sure to time your visit to include this cultural performance in your tour. 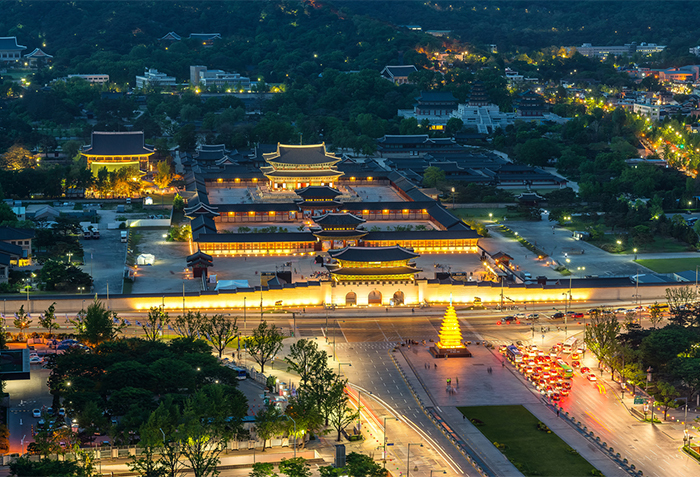 Gyeongbokgung Palace also offers special evening admissions occasionally, so don’t miss the opportunity to enjoy the evening atmosphere at the palace grounds if your schedule allows. The tower features not only an observation deck, but also atmospheric cafés and restaurants among other facilities. Namsan Seoul Tower is a great place to spend an enjoyable evening with friends or loved ones, while taking in the beautiful nightscape over a cup of coffee. ☞ TIP) The secret of Namsan Seoul Tower’s color:The light on the pillar of Namsan Seoul Tower is not random; the light changes to reflect the concentration of micro dust in the air. A blue light indicates clear air with little dust, green indicates an average amount of dust, while a red light signals an extreme amount of micro dust in the atmosphere. 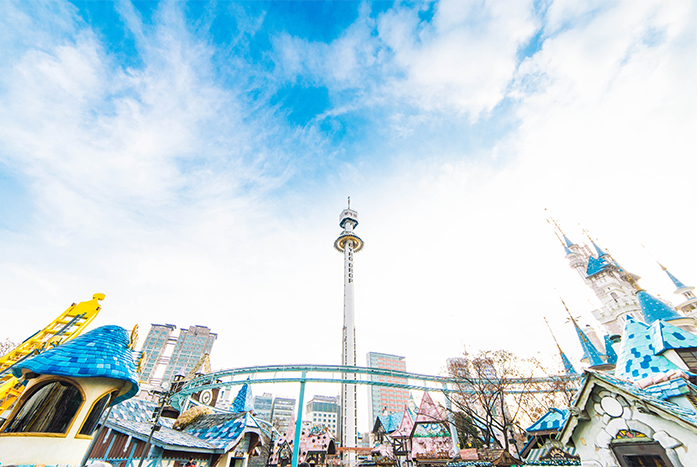 If you are looking for a fun place to spend a whole day, check out Lotte World! This amusement park is open all year round, filled with dynamic events and performances. 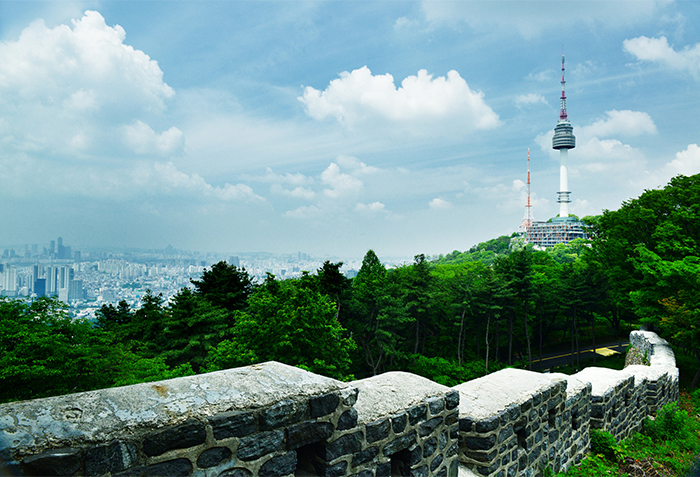 Even better, the park is located in downtown Seoul and is easily accessible via public transportation. The park is largely divided into two areas: Adventure located indoors, and the outdoor section of Magic Island. Adventure includes a plethora of attractions, including a carousel, Spanish pirate ship, flume ride and more, while Magic Island has big thrill rides like the Gyro Drop and Gyro Spin. Lotte World Tower Seoul Sky and Lotte World Shopping Mall are located nearby so make sure to take a look around while you’re here. ☞ TIP) Enjoy more with the Magic Pass! The Magic Pass allows for ride reservation, cutting down on the wait-time for attractions, and is available to one-day ride pass holders. To use the Magic Pass, look for a “Magic Pass” kiosk at the park. After checking available rides on the kiosk, make your reservation! The use of a standard Magic Pass comes free with a One-day Pass, but can only be used three times. A five-time pass costs 40,000 won, while an unlimited pass is available for 100,000 won. A representative attraction of Seoul, Bukchon Hanok Village shows the charm of Korea’s traditional buildings. The neighborhood where relatives of the royal family lived, the hanok here are grand, providing beautiful scenes down every lane. To make the most of your visit, we recommend finding the “Eight Scenic Spots of Bukchon.” These eight locations are each unique but share the similarity of offering breathtaking views. Your souvenir photos will turn out great with these spots in the background! Namiseom Island became a popular tourist attraction after appearing in the Korean drama “Winter Sonata (2002).” Originally just a hilltop, Namiseom Island became an island with the construction of Cheongpyeong Dam, which elevated the surrounding water level. The island is rather small, allowing visitors to complete a full tour within half a day. The island’s effort to preserve nature and reuse recyclable items is quite noteworthy. * Admission includes round-trip ferry ticket. 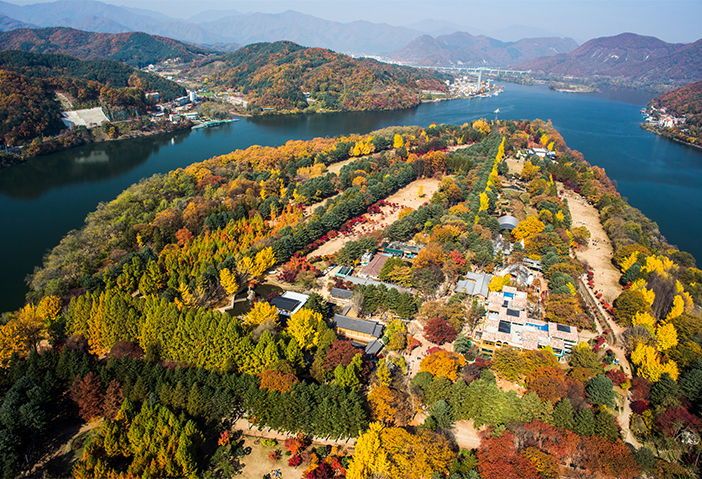 ☞ TIP) Souvenir photo spots: The best places to visit on Namiseom Island are Metasequoia Lane and Ginkgo Tree Lane. Frequently featured in dramas and movies, these two walking paths are at the top of the list for visiting Namiseom Island. Changdeokgung Palace was built in the early Joseon period and, of all the palaces, served as the royal residence the most. The palace boasts a majestic harmony with the surrounding nature as each building was built with careful consideration of geographical and environmental features within the area. In particular, the matching beauty of the palace’s pavilions, ponds, and rock formations is quite a scene to behold. Changdeokgung Palace’s magnificence was recognized internationally and became designated as a UNESCO World Heritage in 1997. 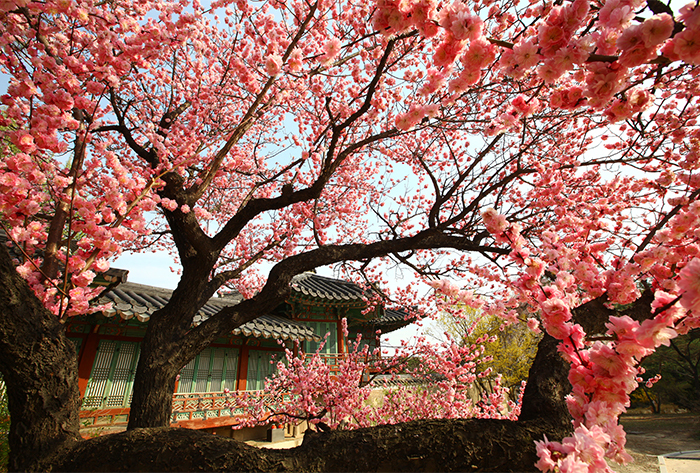 If you’re looking for a charming and nature-friendly palace, head to Chandeokgung Palace! ☞ TIP) Huwon reservations: Advance reservation is required to tour the Huwon. Online reservation is available in English. * Reservations can be made at the website above. Insa-dong is often referred to as the “Street of Traditional Korean Culture.” The main thoroughfare is lined in shops selling traditional crafts and souvenirs, while the many side-streets feature restaurants and cafés serving traditional foods and teas in hanok buildings. There are an endless number of things to see here, but Ssamzigil tops the list. The structure of the building itself is unique, built in a square shape symbolic of the Korean letter ‘ㅁ’ with a single continuing pathway slowly winding up the building from the basement level to the fourth floor. Along the path, you can see art galleries, shops selling traditional handicrafts, furniture, and more. The fourth floor opens up into a sky garden which offers a bird’s-eye-view of the streets of Insa-dong. ☞ TIP) Experience Korean culture in Insa-dong: In addition to things to see, Insa-dong offers enjoyable cultural experiences Visitors wanting to try on hanbok can visit Insa-dong PR Center, and we recommend visiting Museum Kimchikan for tourists interested in Korea’s food culture. 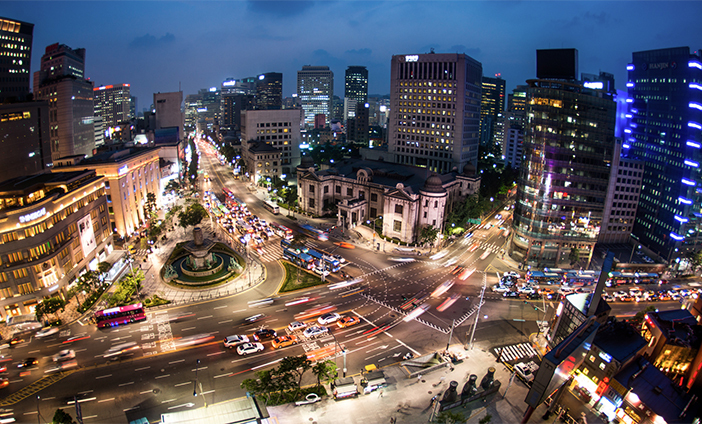 A cultural hub of youthful energy, Hongdae refers to the area near Hongik Univ. Station (Seoul Subway Line 2). Streets lined with cafés, restaurants, bars, and shops are filled with youth and the region is full of exciting vibes given off by live cafés and clubs clustered within. Its influence has recently expanded to include Yeongnam-dong’s Gyeongui Line Forest Park, providing visitors with a relaxing walking path and unique shops inside the urban neighborhood. Many tourist attractions including Trick Eye Museum and KT&G Sangsangmadang are also located here. The area of Myeong-dong is filled with unique street foods and plenty of things to see! 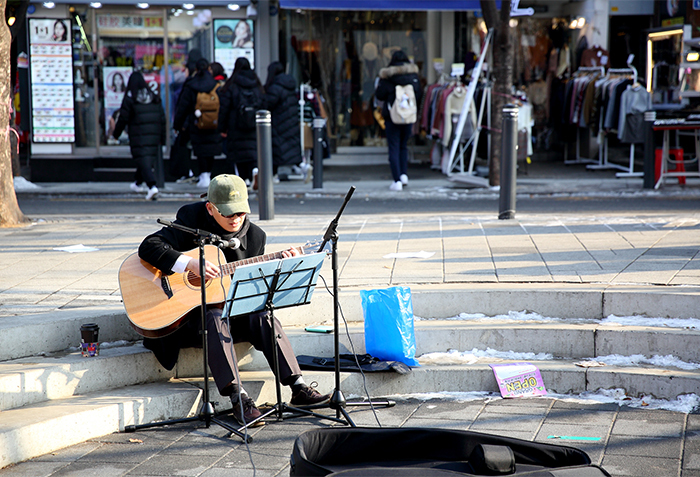 A district of fashion and shopping, many young Koreans and international tourists seek out great deals and the latest trends. Myeong-dong stretches for approximately 1 kilometer from Myeong-dong Station (Seoul Subway Line 4) to Eulji-ro Avenue and Lotte Department Store. The streets are lined with department stores, duty free stores, and various brand shops. Even if shopping isn’t really your thing, you can still enjoy Myeong-dong by trying out the street foods and many famous restaurants in the area! 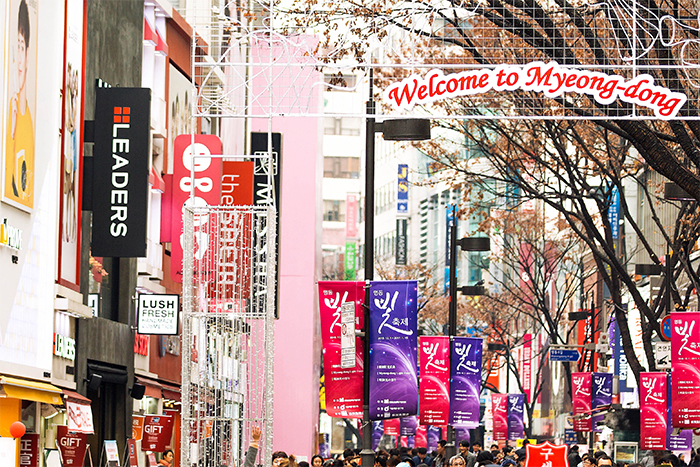 ☞ TIP) Cosmetics are a Myeong-dong must! 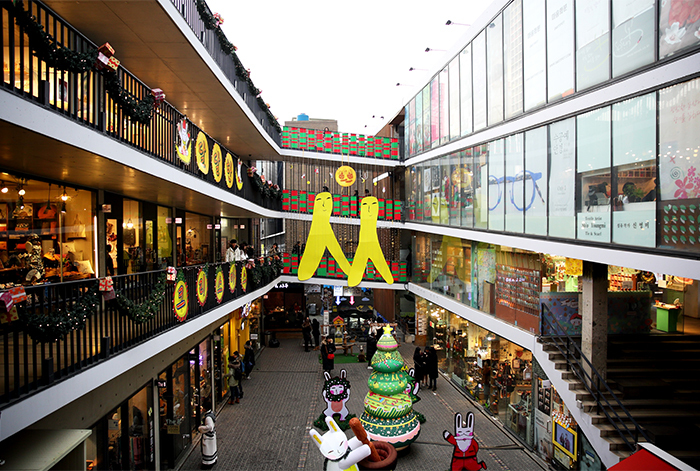 Myeong-dong has been called “Beauty Road” due to the many cosmetic shops gathered in one area. Not only can you find all the major brands here, you will also find several shops offering sales, discounts, and plenty of freebies with every purchase! The Garden of Morning Calm is a botanical garden that presents Korea’s authentic beauty through nature. A variety of uniquely themed gardens, including a lush pine nut forest, offer excellent opportunities to take a relaxing walk or forest bathing. Each garden is connected to flowerbeds and green pastures, or other walkways. 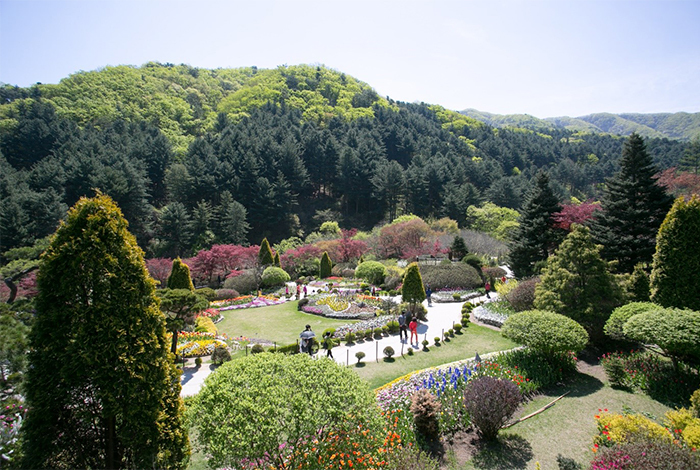 The Garden of Morning Calm is a popular attraction, especially among hallyu fans, as it served as a filming spot for several Korean dramas, films, and variety programs. ☞ Directions: Take the Gapyeong City Tour Bus from Cheongpyeong Station (Gyeongchun Line) or Cheongpyeong Bus Terminal. ☞ TIP) Lighting Festival at The Garden of Morning Calm: A lighting festival takes place at The Garden of Morning Calm every winter. This year’s festival is taking place from December 5, 2018 to March 31, 2019. Consider taking a romantic winter trip to The Garden of Morning Calm if you’re planning to visit Korea this winter. * This column was last updated in December 2018, and therefore information may differ from what is presented here. We advise you to check details before visiting.